There are some new eyeshadow palettes out and I put three to the test from MAC, Marc Jacobs Beauty and Kat Von D Beauty. At first glance the colors look really similar between the three that I have but swatching proves otherwise. They have varied undertones, different textures, finishes and pigment. I’ll say up front the new Marc Jacobs Beauty palettes win for pigment and blendability, MAC wins for the fun factor and Kat Von D is one I have mixed feelings on. The Base and Contour shades are really amazing in texture and pigment. They’re velvety soft and easy to blend. The Define and Topcoat Shades are where this palette gets high maintenance. There is chunky glitter with tons of fall out in application and after application/clean up. You need to apply with either a damp brush or over a super emollient base to make the shades stick. With some glitters I find applying with a finger in a patting motion helps the shadow + glitter stick better with less fall out but with these fall out happened no matter what. If all of the shades were glitter free or in the contour formula this would have been 100% perfect. I can get it to work but it takes a LOT of extra work and clean up. MAC launched six personality palettes in their MAC Girls Collection and I received Mischief Minx as a press sample. I stopped by the counter and was seriously tempted by Prissy Princess and Power Hungry – some other gorgeous neutrals but decided for now to stick with Mischief Minx. It has a palette of shimmers and warm shades. Pigment is medium but buildable. This one is fairly warm in undertone but easy to wear (even the orange and red shades which I mix or blend). Each shade has a name but it’s only labeled in a removable plastic insert which is easy to lose. Last but not least is the Marc Jacobs Beauty Eye-Conic Multi-Finish Eyeshadow Palette in Glambition. I’m a fan of the original Style Eye Con ones and the new ones have excellent pigment and texture which are just as good as the originals. Glambition is the most neutral option and the texture is super soft with a velvety feel. Pigment is just so SO good. Color-wise this isn’t necessarily the most exciting palette but it has easy to wear mix of neutrals and bolds that just work. They also layer well together. Colors left to right include She Was (satiny soft ivory cream shimmer), Infamous (soft rose tan matte), Known For (warm pigmented gold), Seeking (fawn brown matte), The Most (pale pink frost), Over the Top (matte warm brown), Glamour (matte black with gold flecks). I highly recommend the MAC or Marc Jacobs palettes if you’re looking for a new one. The Marc Jacobs palettes have the best formula out of the three I tried but MAC has more fun wearable shade options to choose from. Kat Von D is one I have mixed feelings on – I still think the colors are just so good but formulas are hard to work with and super high maintenance which is not something I have the patience for. If you’re looking for a new eyeshadow palette that’s more streamlined and simple, you might want to check out the Chanel City of Lights Les 4 Ombres – I just bought it and will be reviewing soon. I had planned to do some eye looks but I’m in the midst of a move and upcoming travel so I’m a bit limited on time for the moment. Have you tried any of these formulas yet? What did you think? In case you missed it my favorite eye shadow brushes listed in this post here. Kat Von D Palette available at Sephora and Kat Von D Beauty. 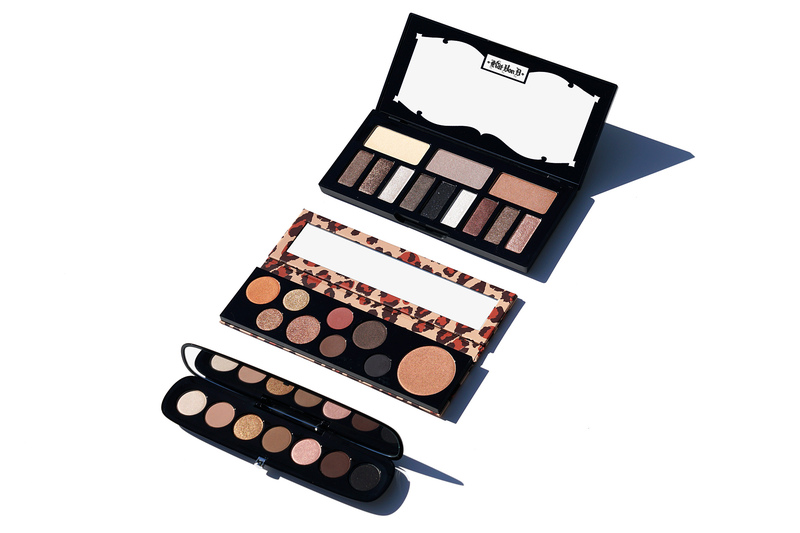 Marc Jacobs Beauty Eye-Conic Multi-Finish Eyeshadow Palette available at Sephora, Marc Jacobs Beauty, Neiman Marcus. MAC Girls Palettes available at MAC, Nordstrom, Macy’s and Bloomingdale’s. MAC palette provided for review. Others purchased by me.